Summer is a critical time for children’s academic and physical well-being. During the summer children are at a higher risk of both hunger and the "Summer Slide". 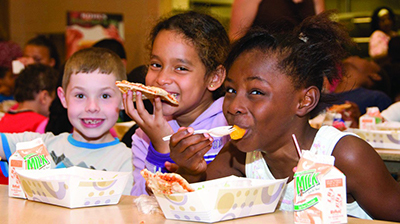 Offering free, nutritious meals provides an incentive for children to participate in summer enrichment programs, which means that children are not only well-fed, but engaged in academic and recreational activities. Many kids who rely on school meals struggle to get enough to eat during the summer months. United Way is proud to partner with St. Leo's Food Connection, Boys & Girls Clubs, YMCA, local school districts and food banks and many more to help provide kids with food during the summer. Use the map below to find a summer meal site near you or call South Sound 2-1-1 by simply dialing 2-1-1. Without summer learning engagement, kids can easily lose what they achieved during the academic year. The “Summer Slide” happens when kids stop learning over summer break. All children can be impacted, but the highest impact is on children from low-income households who have little or no access to books or summer learning programs. That’s why United Way is also distributing books to kids at local summer meal sites and through summer learning programs. United Way is working with local partners like the Foundation for Tacoma Students and the Bethel, Tacoma, Clover Park and Franklin Pierce school districts to connect more kids to summer learning programs. By making sure more of our children have access to summer enrichment programs, we can help them avoid the “Summer Slide”. These opportunities are spread throughout Pierce County and majority quality for aid, and several are even free. United Way has also partnered to provide a web site with summer learning opportunities throughout the county. Check out the web site for activities near you. Join the fight against poverty by helping us this summer! Take your lunch hour and volunteer to read to kids or help with activities at a summer meal site. Hold a book drive and donate them to United Way's Summer Learning efforts. Sponsor a summer meal site. Agree to host a site for the entire summer. Gather your friends and co-workers, come up with activities and spend your summer having fun while helping kids! Get your company to sponsor a field day at one of our sites and rally your colleagues to help pull it off. Download a poster and put it up at your church, your business or in your neighborhood. Share the map to your social media profile and encourage your friends and followers to pass it on. Contact our Volunteer Center at volunteer@uwpc.org to get involved.